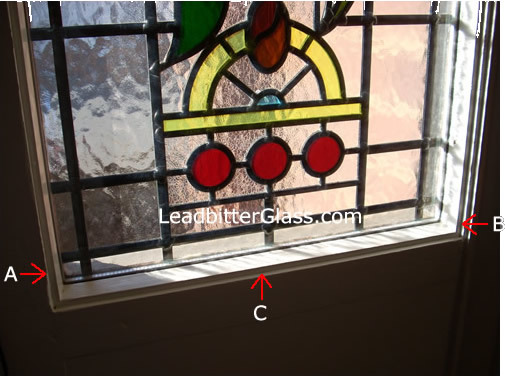 This section is the ‘Leadbitter Glass guide to measuring glass’ in wooden or PVCu window and door frames. 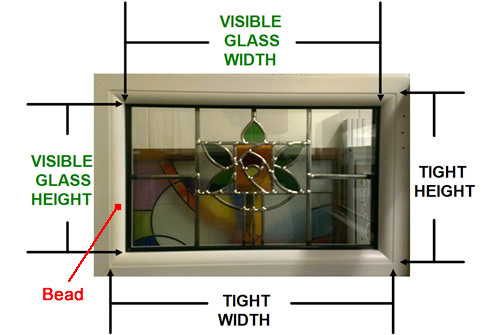 If you require double glazed glass you can learn how to calculate the thickness of your glass later in the section. 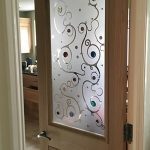 Understanding how to measure your glass is the most important part of ordering your new decorative glass. We use toughened glass for most orders and this type of glass cannot be cut down once it has been toughened so by spending just 10 minutes reading our tips below will ensure that the ordering process runs smoothly. For larger orders we can make a site visit to measure but this will incur high costs to most orders. 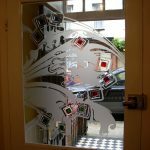 We require you to supply us with Glass sizes and the Visible sizes. We do not want Tight’ sizes’. These are all explained below. 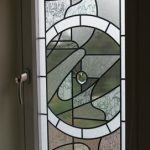 If your chosen decorative glass design contains a border or other elements of the design that are located near the edge of the glass, it is very important that you supply us with the ‘visible glass sizes’ as well as the ‘glass size required’. may not fit into the frame. 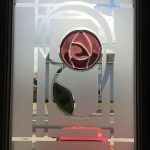 When ordering your decorative glass with us, we need you to supply us with the dimensions of the glass being slightly smaller than the ‘tight size’ as illustrated on the first image above. The amount to deduct depends on what type of glass you require. Double glazed glass would need more deducting from the tight size compared with single glazed glass. 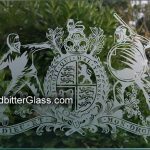 Please read further down this page for a detailed explanation on how much to deduct and how to measure your glass correctly. As an example the measurement of C to D is 1023mm in height. We now have a measurement of 615 x 1023 but this is not the accurate glass size because this is the tight size (see above) A small amount needs to be deducted so that the glass can be positioned correctly and also compensate for any slight errors by the glass cutters. 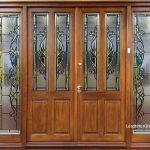 A common amount to deduct for single glazed glass in wooden frames is 5mm and this measurement needs to be deducted from the width and also the height therefore the accurate glass size for this frame would be 610mm x 1018mm. As an industry standard, the width is always stated first when supplying glass sizes….width x height. If you require a double glazed sealed unit you will also need to calculate the thickness of the glass and you can learn more about this further down this page. 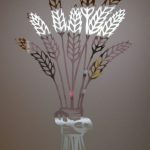 Firstly you must locate where the beading of the frame starts and this is usually where the flat part of the frame/opener finishes and starts to shape in towards the glass. 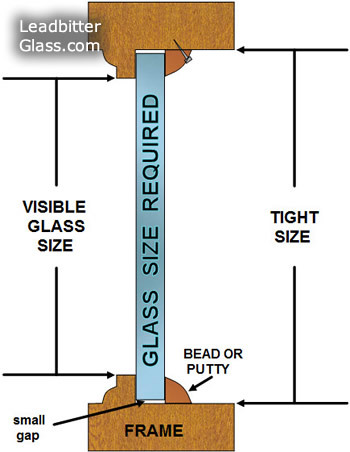 With PVCu frames the beading isn’t always on the internal side of the frame, it may be an externally beaded frame so check both sides. Above you can see the red arrows A,B & C pointing to the area where the PVCu beading slots into the PVCu frame. To measure the opening of the PVCu frame you would measure from A to B for the width and in this instance let’s say that A to B is 455mm wide. You then need to measure the height of the opening. This measurement is taken from C to D (D is not shown in the photo but it is the opposite of C) Let’s say that the measurement of C to D is 994mm in height. 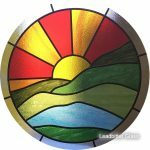 We now have a measurement of 455 x 994 but this is not the accurate glass size because we need to deduct an amount so that the glass can be positioned correctly and also compensate for any inaccurate measuring by the glass cutters and any imperfections made during the double glazed sealing process. A common amount to deduct in PVCu frames is 10mm and this measurement needs to be deducted from the width and also the height therefore the accurate glass size for this frame would be 445mm x 984mm. As an industry standard, the width is always stated first when supplying glass sizes….width x height. 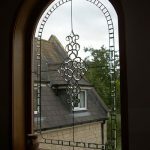 As these types of frames are double glazed frames you would also need to know how thick the double glazed glass is and this is a little bit tricky. 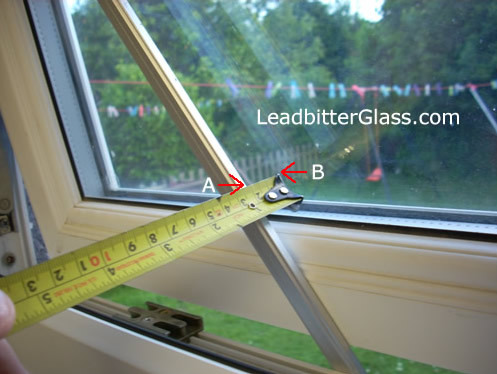 We have a section below to help you calculate the thickness of your double glazed sealed units. Most double glazed sealed units in PVCu frames are either 24mm or 28mm thick and wooden frames can be any thickness from 14mm up to 28mm thick. You should be able to check with your supplier for these dimensions. If you purchased the windows/doors a long time ago the information should be on your receipt or warranty. If you do not have this information to hand then you will have to calculate the measurement yourself. This is tricky but it can be done and you will need a tape measure and a straight edge such as a piece of wood. 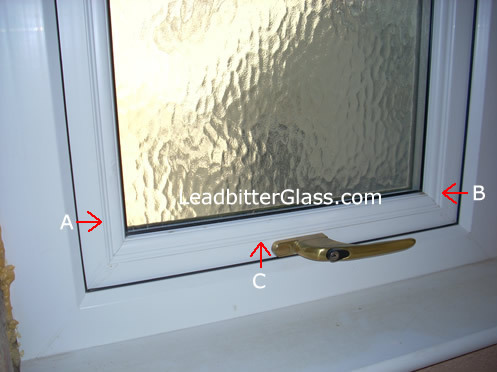 Firstly measure how thick the PVCu frame/opener is and then place a straight edge against one side of the frame and let it protrude into the area of the glass (as the picture above) . As the straight edge will be flat against the PVCu, it should be floating away from the glass. Measure the gap (A to B) from the glass to the inside of the straight edge and write this down. Do the same with the other side of the frame and note the measurement again. To calculate the thickness of your double glazed sealed unit you would need to deduct these 2 measurements from the thickness of the PVCu frame and you should have a measurement of either 24mm or 28mm. 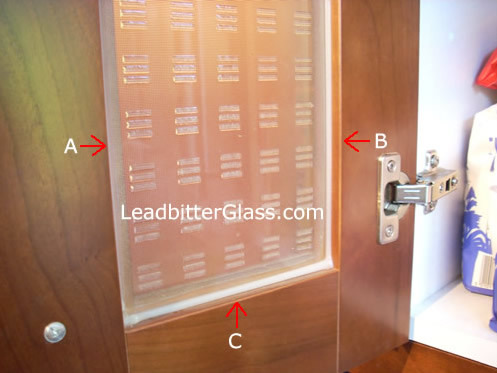 As an example, the frame that holds the glass is 62mm thick, the A to B gap (as the photo above) of one side is 17mm and the A to B gap of the other side is also 17mm. This gives us a measurement to deduct of 34mm. 34mm deducted from the frame thickness of 62mm is 28mm and this figure is the thickness of the sealed unit in this frame. Most Kitchen cabinet frames do not have a beading system and the glass is usually glued in from behind as our photo shows. Above you can see the red arrows A,B & C pointing to the area where the kitchen cabinet glass will slot into the door frame. Measure the opening by taking the width of A to B and in this instance let’s say that A to B is 336mm wide. You then need to measure the height of the opening. This measurement is taken from C to D ( D is not shown in the photo but it is the opposite of C ) Let’s say that the measurement of C to D is 722mm in height. We now have a measurement of 336 x 722 but this is not the accurate glass size because we need to deduct an amount so that the glass can be positioned correctly and also compensate for any inaccurate measuring by the glass cutters. A common amount to deduct for kitchen cabinets is 4mm and this measurement needs to be deducted from the width and also the height, therefore the accurate glass size for this frame would be 332mm x 718mm. As an industry standard, the width is always stated first when supplying glass sizes….width x height. 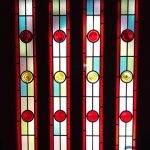 The tips and advice on this page are just a helpful insight into measuring and installing of glass panels. 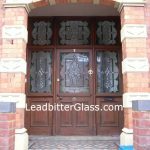 Leadbitter Glass does not accept any responsibility if you are injured or suffer loss – financial or otherwise by following our tips and advice from this page. These tasks should only be undertaken by a competent person that is skilled in DIY and should not be attempted by DIY novices. 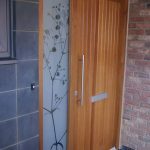 If you are not a competent person in DIY we advise that you hire a tradesman to undertake your glass measuring and installations. Leadbitter Glass do not accept responsibility for the incorrect measuring of your glass. The only guaranteed way to get accurate glass sizes is to obtain the sizes from the window/door manufacturer at time of purchase.